A Nigerian man who allegedly defrauded a businessman N500,000 and used the money to marry his wife who is a police woman has been dragged to court. A 40-year old staff of 7up Bottling Company Nigeria PLC in Oregun, Lagos, Johnson Oke and a serving female Police officer attached to Ketu Division, Muraina Kafayat have landed in troube after defrauding a business man. According to PM Express, Oke claimed that he was under intense pressure from Muraina who already had two kids for him during the relationship and was desperate for marriage and he had to look for ways to raise money to marry her. Oke allegedly defrauded a business man, Casmir Ezeire to the tune of about N500,000 under the false pretence of supplying him scraps from the company as the manager. Ogun State-born Oke reportedly used Muraina’s Bank account to perpetrate the alleged fraud and did not supply any scraps to Ezeire as he promised. Rather he was said to have used the money for traditional marriage and Wedding to consolidate his relationship with his wife. The society wedding attracted both family relations and friends took place in May 2017. However, the wedding has landed the couple into trouble as they were unable to pay the debts incurred after the wedding before Ezeire matter came up. The matter was reported to the police and Oke was arrested and detained at Alausa Police division where he allegedly confessed that he obtained part of the Money through Muraina’s account. However, the wife claimed that she did not knew that the money paid into her account was the proceed of fraud as her husband told her that it was a business transaction. On the issue of marriage, she said she made adequate arrangement and borrowed money for the marriage and her husband only brought small amount of money for the marriage. Johnson was taken before Ogba Magistrates court and charged with obtaining Money under false pretence and stealing under the Criminal Code. He pleaded not guilty. 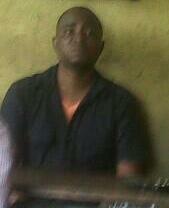 The presiding Magistrate, Mrs O.I Raji granted him bail in the sum of N100,000 with two sureties in likne sum. The matter was adjourned till 28 July 2017.